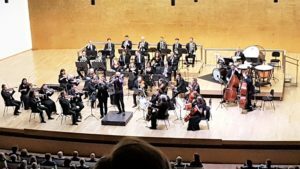 On Wednesday November 14, 2018, the Adda Sinfonica, Alicante, featured the Israeli Kibbutz Orchestra. The program included music of Grieg, Lindberg, Leopold Mozart and Sibelius. The “house” was packed, the music just wonderful, and the ovation tumultuous. The final encore was a remarkable example of modern jazz played by Pacho Flores (trumpet), Christian Lindberg (trombone) and full orchestra. 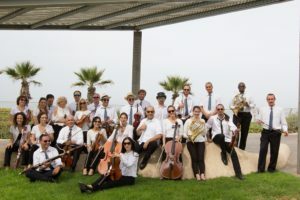 Since its establishment in 1970, The Israel Netanya Kibbutz Orchestra, (IKO) has been regarded as an excellent and unique musical institution, and one of the shapers of the Israeli cultural landscape. It performs 120 concerts every season, presenting imaginative, up-to-date and refreshing artistic programs. Its original and experiential approach – classical pieces alongside folklore and jazz, and combinations of different styles, artistic, vocal and visual – makes its uniqueness. Its offices are situated in Netanya, Israel. The Orchestra performs 120 concerts every season, presenting imaginative, up-to-date and refreshing artistic programs. Its original and experiential approach – classical pieces alongside folklore and jazz, and combinations of different styles-artistic, vocal and visual – are what build up its uniqueness. 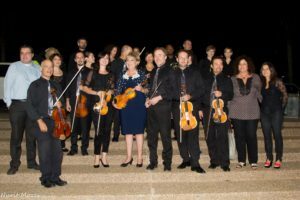 The orchestra holds a special educational program, in which 140 orchestral and chamber concerts are held for roughly 23 thousand grade school children in Israel. The Orchestra’s performances worldwide, in the United States, Mexico, South Korea, Germany, and Spain, are always extremely successful successful. We look forward to their return to Alicante in future years.